WOW! Great sight! Very informative. Thanks for linking it. in the Netherlands helms do not indicate rank which is just as well as almost evryone seems to use a barred helm, I have the other kind in my arms because I like it better. Further you will not see a combination of a helm and a coronet of rank in the arms of nobles as it is regarded as bad practice, you can only put one thing on your head so to speak. So you have noble families that use a coronet and other noble families that use a helm in the arms. ... you can only put one thing on your head so to speak. I can't immediately find a contemporary picture of King Henry V in armour with a crown or coronet on his helmet. 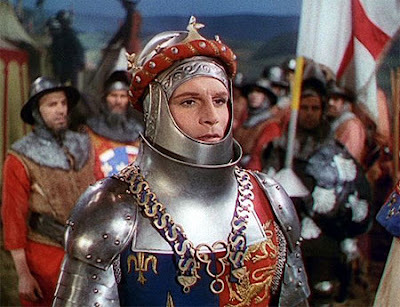 But here is a picture of Laurence Olivier as Henry V in the 1940s film of Shakespeare's play. The designers worked very hard (remember that this was during WWII) to get the details of dress etc right - note the correct heraldry and collar of SS. The armour looks authentic too. Then again one can find examples of why a crown might not sit well on a hat! Isn't that the one where they show the knights being lifted on their horses by cranes? Don't remember that bit - it is 40+ years since I saw Henry V with Larry O. Seems unlikely that they would have had cranes with them in the Agincourt campaign. That's more of a tournament idea - even then unlikely as knights were trained to do everything in armour that they could do without it - including mounting a horse. But films are odd. They often work hard on getting some things right and then make a complete howler over something else.